If you are struggling to find the perfect present for a golf obsessed chum or family member this year then look no further. Here at T3 Towers, we've rounded up the best, most cutting edge, golf gifts you can buy today. Whether it’s a top of the range golf GPS watch for the special someone in your life or a pack of golf balls for your best mate, we can guarantee that you’ll find the ideal gift in the list below. You’ll also find swing trainers for those looking to improve their shot and golf simulation software for those who can’t stand a wet day on the course. We’ve also got the latest, state-of-the-art distance finders for those who really want to improve on their handicap. Simply put, we've got all the kit to make you or your gift receiver a better, more happy golfer. The brand new Approach S60 from Garmin packs an ark full of golfing features into the one sleek wearable, offering you seemless access to over 40,000 preloaded courses. Simply use GPS to locate your nearest course, then you'll be able to see all the important stats for each hole. It has a large, 1.2-inch, sunlight-readable color touchscreen display for ease of use in any weather, with that all important GPS functionality presenting precise yardages to greens, hazards, doglegs and full-color course maps. It also comes with convenient Quick Fit bands for fast style changes without the need for fiddly tools. We could all do with the luxury of our very own golf coach, but those of us yet to get the invite to a PGA Tour, we'll need to rely on the next best thing - the Zepp Golf 2 Swing Analyser. The nifty little gadget simply fits onto the outside of your glove, connects to your smartphone via a free app and proceeds to analyse every aspect of your swing in real-time. It's an ideal way to improve your game, offering instant evaluation based on club speed, club plane, tempo, backswing, length and more. 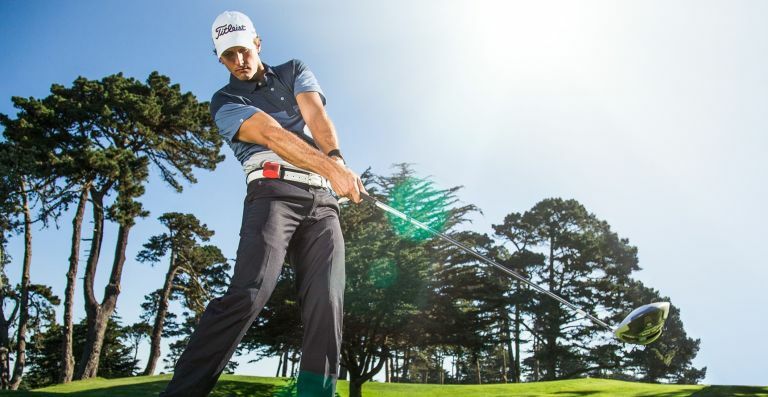 Crucially, with the Zepp 2's Smart Coach, you can then follow step by step training guides to adapt and perfect their swing, taking your game to the next level. And, what's great, is that the Zepp Golf 2 has a battery life of eight hours, meaning you can monitor your play for an entire day on the course or driving range. Smart and sophisticated, this hybrid golf shoe from renowned brand Ecco will ensure they look fly on the course. Made from leather and with a supportive lace up design, these golf shoes promise comfort and breathability, while the water repellent hydromax technology and leather sweat absorption lining ensure the feet remain dry, no matter the weather conditions. With the TPU outsole providing that much needed traction on uneven terrains and the range of colours ensuring the shoes remain on par with the rest of their kit, these hybrid golf shoes are a solid idea if you’re buying for the golf lover in your life. Whether you're a relative newcomer to the world of golf or a seasoned pro with countless hours on the green, judging your distances can often mean everything when you're teeing off. To ensure you hit the ball with the right power, invest in a powerful distance reader such as the Coolshot 80i VR from Nikon. It comes with an eight-second continuous measurement that enables you to scan an area to find all the distance data you need, including the handy ability to identify slopes so you can select the proper club for uphill or downhill shots. So wherever you are on a hole, you'll always know exactly how far you are from the flagstick. Under Armour attire may be expensive but when it comes to playing a soggy round of golf, we’re doubtful you can get much better. With its GORE-TEX Paclite technology, this clever jacket is completely weatherproof but still fits snugly in whatever bag they happen to have on the course. Despite being both wind and rain proof, the jacket still maintains breathability, so sweating is kept to a minimum, while its design ensures they shouldn’t feel any restriction when it comes to that all important swing technique. Designed to suit any golfer, Game Golf Live uses a set clever, feather-light red tags which fasten to the grips of your clubs, working in tandem with a small unit that clips onto your belt. Through a bespoke app, this gadget tracks your game as you play, building a picture of your performance shot by shot and hole by hole. You can then load up the app on your iOS or Android device and peruse precise distances to greens, hazards and landing zones. You can even see your very own club distances and shot dispersion patterns, and consume robust metrics to pinpoint improvement opportunities. When you're grinding away to improve your handicap or simply trying to shake off that 'beginner' badge, having a robust and reliable glove can mean everything. We think this affordable and reliable glove from Zoom is a perfect fit, which uses its own Flexx-Fit design to ensure no part of your hand feels restricted regardless of how big or small it is. The weather-ready glove features a honeycomb design that helps to get more grip in wet and cold conditions for improved control on the course. And it comes in six colour combinations, so even the most fashion forward of golfers will be able to suitably styled. Golf can quite the addictive hobby, but not all of us have the time to spend every spare moment out on the course or on the driving range - so how about a driving net you can set up at home? This one is an official PGA Tour product, and offers targets for practising your lob, your chip and a decent pitch. Ideal for use by both young and older golfers, the PGA Tour Pro Size Driving Net is sturdy enough to take your gradually improving shots (as long as you're using practice balls, rather than proper weighted ones) and can be used both indoors and out in the wild outside. It also includes a carry bag for easy transport and a training video from the PGA itself. If you’ve clocked that their golf bag is looking tired and worn, you can’t go wrong with buying them a new one. Apparently, this is the same bag used by leading professionals, with its lightweight, ergonomic construction putting it at the top of the pile when it comes to usability and longevity. There’s a 9.5” 6-way top divider for organising their golf clubs, as well a thought out handle and strap system and plenty of pockets for accessories and snacks. Another golfing gadget geared toward improving a golfer's swing, the TruSwing from Garmin is an advanced swing sensor that delivers measurement of metrics such as swing tempo, speed, club-path, club angles and more. It also syncs up with a number of Garmin Approach products (including the S60 above included this this guide), so you can take a swing of your club and immediately be able to check your smartwatch to see how well you performed. If you love raw data and stats, you'll really dig the depth the TruSwing offers. If you're new to the golf scene, you'll still feel empowered by 3D animations that break down your swing and how to improve it. The physics behind the design of golf balls is incredibly complex and it’s not something they really need to worry about until they have started to perfect that all important swing. If you know how your golf buddy plays, getting them a pack of balls is certainly a great idea, especially when it’s a quality set like this one from TaylorMade. Offering maximum energy transfer, fantastic spin for accuracy and control, plus the benefit of a greater distance and higher launch than the TP5 balls alone, the TP5x balls will ensure a winning round. Updated for 2017, the Powakaddy C2 is the electric caddy that does it all. The sturdy design can hold all your clubs, irons and putters and will travel by itself to distances between 15 and 45 yards. It's fully colour display shows battery charge and can even be used to charge your smartphone or smart device while you're attempting to reduce your handicap. It's really easy to move around manually, and folds down in just two steps. It also comes with a premium carry bag so you can pack it away in your car without making too much mess. An ideal purchase if you want to spend a lengthy session at your local golf club. One of the latest additions to Nike's Trainer P range, the EV0939-001 model comes in matte black/silver and features a pair of polarised grey lens features (with Nike's own max optics lens technology, no less) for precise visual information at all angles of view. These cross trainer sunglasses have a lightweight eight-base injected frame design that fits the contours of your face without that telltale pinch. Add in an auto-adjusting ventilated nose bridge is for a customised fit and added grip and you've got a perfect set of sunnies to take on the green during summer tournaments. Interchangeable lenses are also available, but you'll need to pay extra for those. There’s no hiding the fact that this golf simulator is on the expensive side but the level of data accuracy and advanced technology included in this package make it better than so many of the other golf simulation softwares out there. Including a launch monitor to help them perfect their swing and measurable parameters including ball speed, distance, launch angle, club speed and spin rates, this promises to be a first class system that’ll help them to improve their game from their living room. If you like the idea of buying them golf simulation software, you can also check out our full list of the best home golf simulators for more options. If you invest in just one tool for your golf game, this could be the one to help you improve your handicap once and for all. The All-In-One Swing Trainer reinforces the correct setup and builds the muscle mechanics you need for a proper swing. It includes fully adjustable components for golfers of any height and breaks down for easy storage and portability. It's been designed to help foster that all important inside-square-inside swing path, which will eventually eliminate unwanted slices. The sturdy design can also help improve head movement, hip sway and your posture as you come out of your swing. It works with golfers of any height and breaks down for easy storage and portability.